Samsung Electronics’ mobile payments service Samsung Pay has hit 5 million subscribers, with combined transactions exceeding $500 million in Korea and the U.S. since its debut in August. The Korean tech giant said Saturday it will start the service in China in March and other countries such as Australia, Brazil, Singapore, Spain, the U.K. and Canada in phases later this year. Detailed plans for its future launches and partnerships with local banks and card issuers are expected to be revealed during the Mobile World Congress in Barcelona this week. 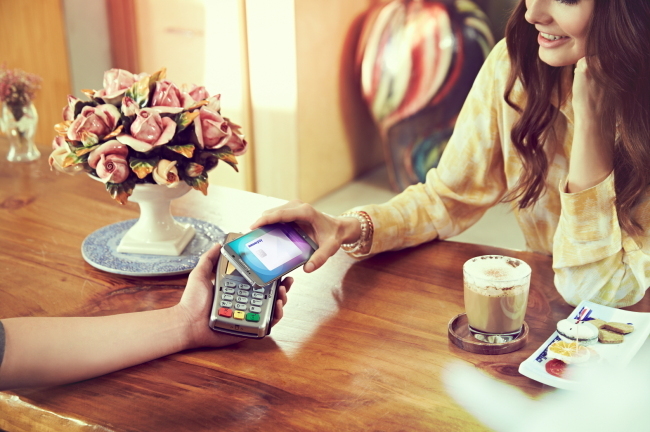 Samsung Pay boasts better compatibility than other services as it uses both near field communication technology and magnetic transmission. The former requires a special NFC terminal while the latter can work with existing card readers. The company aims to secure an edge over its key competitor Apple Pay, a service which is based on NFC. The two rival firms are pinning high hopes on the fast-growing mobile pay market in China. Samsung believes its service will help the company build customer loyalty for sales of its future devices. While Apple takes a 0.15 percent cut from card companies, Samsung offers the service for free to rapidly attract as many mobile users as possible. Early this year, Samsung announced it would make its Gear S2 smartwatch and Samsung Pay compatible with iPhones.